In the period 2019-2020, the EaP CSF National Platforms will be funded via the grant that the EaP CSF Secretariat is receiving from the European Commission. Financial Support to NPs (FSTP) is meant to support the National Platforms of the EaP CSF in strengthening mechanisms of trilateral dialogue with participation of civil society at the national level dedicated to the sector reforms in the framework of the EaP. 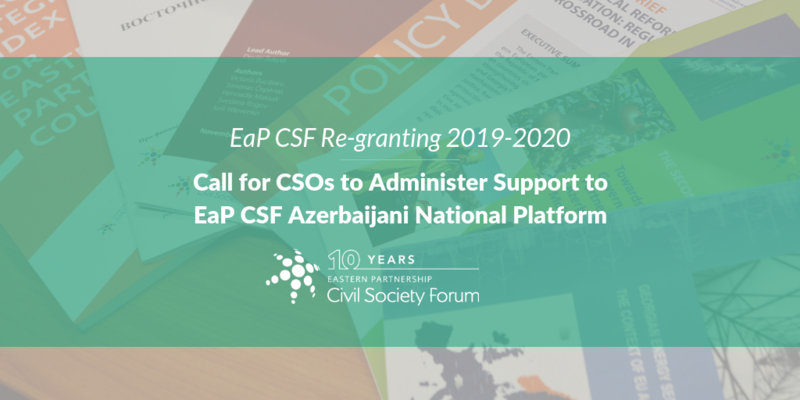 This call aims to solicit proposals from organisations who can administer the support to the Azerbaijani National Platform of the EaP CSF and will provide to it the administrative support for the period of 2019-2020. The overall amount made available for Azerbaijani National Platform for two years (2019-2020) is a maximum of 100.000 EUR (50.000 EUR/year). Prior experience working with civil society platforms or networks and administration of re-granting calls is desirable. The support to Azerbaijani NP will be divided into two parts: i) Secretariat and ii) project support. Monitoring of 20 Deliverables implementation. The implementation period of both the Secretariat and project funding is two years (phase 1: April – December 2019, phase 2: January – December 2020). The selected organisation will be working closely with the Azerbaijani National Platform and the Secretariat of the EaP CSF to implement the support that the National Platform needs in lines with the grant requirements of the EC. The organisation will implement the project support in the amount of 20.000 EUR per year via the open call for the small projects ensuring transparency and impact. The selected organisation will launches the call and administers the process. The selection body takes the funding decisions. The implementing organisation cannot benefit from the project support. All interested organisations are encouraged to submit a proposal about their qualifications for this role in line with the eligibility criteria and how they will approach the implementation of the support to Azerbaijani National Platform in terms of the key staff and procedures, including the accountability to the National Platform and its Board, bearing in mind the joint co-ownership of the project between the organisation and the Azerbaijani National Platform. The organisations need to submit the budget clearly indicating the costs of administration of this support that it is recommended not to exceed 10% of the total budget. The final budget of the action will be developed based on the priority needs developed by the Azeri National Platform and the requirements of the grant with the EC. The organisation will be providing the semi-annual and annual narrative and financial reporting to the EaP CSF Secretariat in line with the requirements of the EC. Proposals must be submitted to the following email address: applications@eap-csf.eu by the extended deadline: Wednesday, 17 April 2019, Midnight (23.59 Brussels time). Questions about the call can be addressed to Iustina Haroianu (iustina.haroianu@eap-csf.eu).